There is a known crash when entering Export the second time, which is with development to fix so it sounds like you keep bumping into this. It has been fixed for the next beta. Thanks a lot for the reply, Sean and Mark! I can see that the ruler in the beta version is missing a lot of tick marks, but I'm not getting that here. Is the document DPI set to the same value in both cases? The screenshot for the beta is showing less of the ruler than the other screenshot so I suspect the tick marks are all OK. It took me a while, but I assume he's highlighting the missing drop shadow. The drop shadows aren't coming back, but we are going to add a keyline around the popups so that the edges are more obvious. 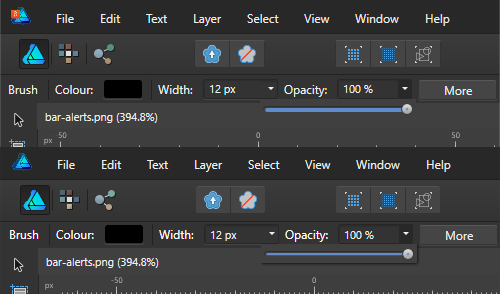 Now click the check box to hide the first layer (at the bottom) or the second one in the middle, The drawing does not update, you have to zoom in or out to get it updated. The same problem exist in Photo beta.81 (reported). The problem occurs on any layer except the one at the top when there is three layers or more. That would be great. Sometimes the color matches that of another element and it gets a bit confusing.